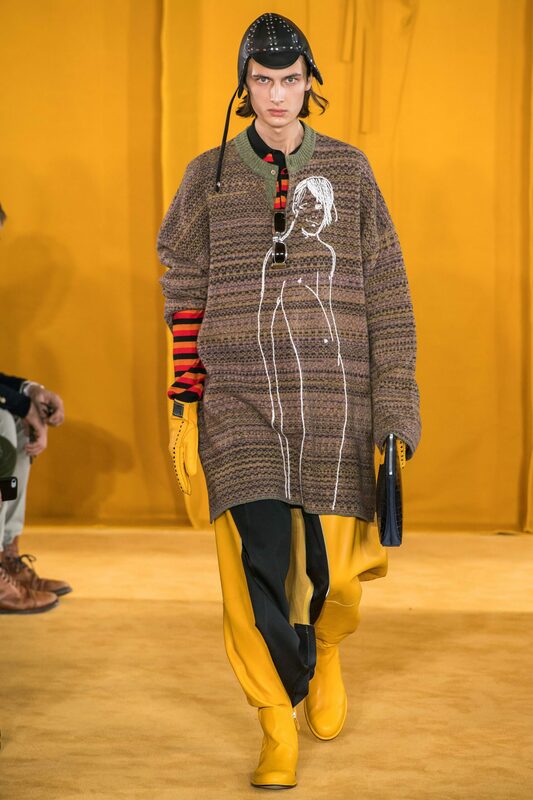 Jonathan Anderson debuts first menswear show for Loewe at Paris Menswear Fashion Week. Fitting with autumn ambience, the fashion show features a yellow-cloth lustrous cotton sculpture by German artist Franz Erhard Walther. The artist is known for his performative practice where he wants the viewer to interact with his artwork. Deriving meaning from the way fabric is utilized to both shield and protect the body but also the way people interact with fashion on others. Working with long silhouettes, neutral colors, and a westernized boot that could take you from runway to the clutches of a swamp. “We were looking at gaiters and fishermen. It was early eighties, kind of, when we unzipped them. It created kind of flaps – western, but non-western. It was how to take something fetish and de-fetishize it.” Anderson says about the boot. There are some funky oversized graphic printed shirts. From line drawings of Keith Vaughan to an iconic Marilyn Monroe. “How do you take basics and make them fashionable? If a consumer is going into a store and they want to get the look, they can buy just a knit and they get the full impact of it.” Anderson said.